When Chrysler Group Designer John Opfer sketched out the Dodge M80 Concept, he was thinking about “stylish, low-cost four-wheel drive” vehicles. That’s exactly what the Dodge M80 Concept was, and so much more. Based on a modified and shortened Dodge Dakota platform, the Dodge M80 Concept had hints from vehicles like the 1949 Dodge TC and ’41 Dodge WC. Should Ram build a compact pickup truck, similar to the M80? It utilized much of the running gear from a Jeep Liberty including the 210 horsepower V6 that made 235 lb-ft of torque. A 5-speed manual and standard (for the Liberty) 4-hi/4-lo transfer case were part of the package too. All of the body panels, bed and interior were unique to the vehicle, but a majority of the switchgear was shared with its brethren. The interior was extremely flexible with some cargo space behind the seats and the rear glass flipped up, giving the short bed a little extra space for long objects (surfboards?). The passenger seat folds flat and a stainless steel cupholder is embedded on the back of the passenger’s seat too. Sadly, Dodge never produced the little truck, although it is said that there was quite a debate and the M80 was nearly given the green light. The reason we wanted to look at this truck concept this week is because of one of its spiritual successors, the Jeep Scrambler. Like the M80, the Jeep Scrambler pickup truck is super utilitarian and built for off-road adventures. We just found out that the Jeep Scrambler may be hitting the road with (possibly) higher towing ability that most of us expected. Click (here) for that story. 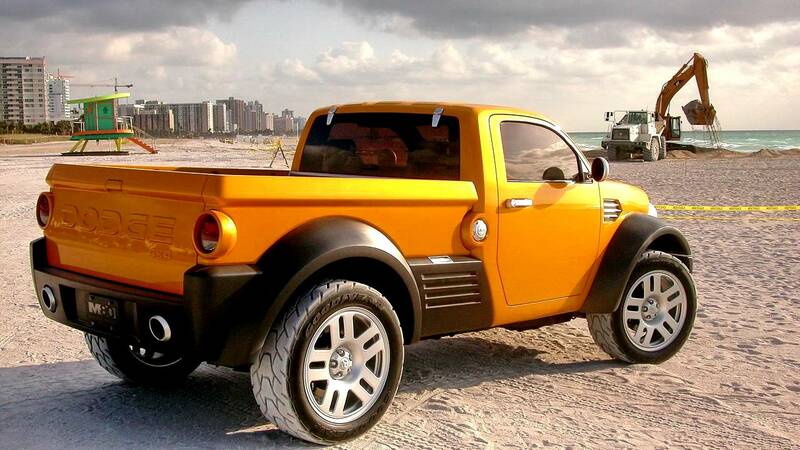 While many of us love the design of the Dodge M80 Concept pickup truck, it’s doubtful that Ram would every build anything like it. Consumers have lost their taste for two-passenger trucks and, while the mid-size market is back on the rise, why build a competitor to the upcoming Jeep Scrambler?